Monday, 21 November; Croydon Crows. PF moot held every 3rd Monday of each month at the Skylark pub, South End, South Croydon from 8pm onwards. Wednesday, 23 November; talk by comic book writer and magician Alan Moore, author of Watchmen, Promethea and V for Vendetta among many other things, at Pagan forum The Moot with No Name. Venue: Devereux public house, 20 Devereux Court, off Essex Street, London WC2R 3JJ. Meet from 7.30pm, event starts at 8pm. Admission £5. Advance booking is essential. 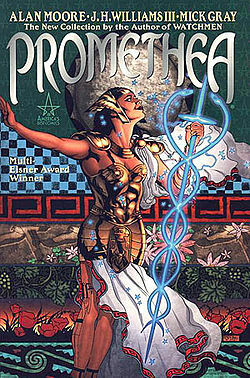 For more information and details on how to book, visit http://www.theatlantisbookshopevents.com/ The picture right shows Alan Moore's graphic novel Promethea.